Wow, over 4” of rain Tuesday; the beaches had closer to 7”, setting records that go back to 1972. I hope it didn’t wash out the seeds I planted last week but I guess it’s possible. If nothing pops up in the next few days, I’ll replace them. I’m usually worrying about seedlings drying out but this year it’s been washing out. Maybe I should try rice. I can’t remember the lake being this full going into the winter season. Usually November is a dry month but we’re experiencing a very wet one following an unusually wet October following an unusually wet September. George’s field is a swamp, the garden being an island – a veggie hammock. I’m sure I’ve never seen the lake this high so late in the year. And if you’re curious about the seeds that I planted last week before the deluge, the Tatsoi and Tyfon, whatever they are, did actually germinate. Not so the Broccoli Raab. That seed was a couple of years old so it’s possible that the flooding was not the problem. And as hoped, the speckled perch are schooling and biting well. We headed over to Joey’s on Wed, did the Thanksgiving thing on Thursday and then home to the lake on Friday. Thanksgiving came off just fine with no hitches in the getalong as best I could tell. The weather was warm enough for the outdoor dinner, upper 60’s, and the tent was sized perfectly for 20 people. I’m not sure who brought what particular dish but all the ones I sampled were really good and there was plenty. Katie Ronca showed up after a 3 hour drive that extended a couple hours because of a dead battery along the way. She fit in perfectly and within a few minutes of her arrival you’d have never guessed that she didn’t live here with us. I’m sure we’ll be seeing her at future events. Made the first green smoothie of the season. I have sufficient Kale and Spinach to make one every day now and will soon be mixing it up with such favorites as Collards, Kohlrabi greens, Swiss Chard, Tyfon and Tatsoi. I could be the first person on the planet to have mixed these into one concoction. I guess if I make a toxic mix it’ll smoke or start to bubble on it’s own. Also picked the first cherry tomatoes of the season so the tomato season was not a total bust. We need to fight off the vortex for another month to make it semi successful. Maybe I should pop one of those into the next smoothie. Radishes? We had a great pasta dinner last night using a special pasta Nancy had picked up in Eataly during her trip to Chicago. The shape was tubular rings, similar to rigatoni but shorter, wider, and with no ribbing. Excellent. It was packaged unusually for the US market – 2.2 pounds. We split that in half and the half we cooked is enough for two meals for us so even though it’s a bit expensive for pasta, on a per meal basis, well worth it. We’re looking forward to Thanksgiving this year since it will be a family first – Joey and Mark are hosting. Usually we have it at Tom’s and occasionally at the lake. We’re going up on Wednesday so Nancy can help with the prep. I’ll probably conduct a personal wine tasting just to make sure it’s perfect for the guests. I think the head count is currently at 20 but it changes daily – a combination of friends and family. One special attendee this year is Katie Ronca – Nancy’s cousin’s daughter. She lives in Ft Lauderdale and reached out – a little push from her father no doubt. Her parents split up, probably 20 years ago and I don’t think we’ve seen Katie since she was a toddler so this is going to be fun. I hope she feels comfortable enough to visit from time to time. I was down at the lake this morning after digging around in the garden and pitched my beetle spin towards some lily pads off the dock. Got 3 small spec’s in 6 casts. So about 4PM I decided to try seriously, trolling the same beetle spin plus my dual jig rig from the boat. I had about an hour to kill and got 6 fish; not so bad. What made me the most happy was that I caught the fish trolling in one of my original hot spots that had disappeared when the lake was lower. I’m getting psych’d that this season may turn out to be a winner with quite a bit more water in the lake than the last few years. I went back out the next morning and it was almost perfect – 75 degrees and overcast. One thing different – my eyes have deteriorated since last season. I tried to change lures out in the boat and it took almost a half hour to tie the knot. I either have to put a pair of glasses in the boat or switch my line from 6 pound test to 50 pound test so I can see it. While I was focused on the knot, the overcast turned to rain so it wasn’t a picture perfect trip. For those of you (and me) that were concerned about the Swiss Chard crop, quit worrying. It’s finally coming on nicely. I just forget how long it takes chard seed to germinate. Switch your concern to the parsnips which have yet to pop out 10 days after planting. I do remember that from last year so we’ll hold off getting concerned for another week. None of the new, experimental greens have popped out yet but I don’t really know what to expect. I nominally plan on a week and these are not yet in the ground that long. Somewhere between arugula and parsnips is normal. No surprise that Hagel split from DOD. I believe that means we will have had (at least) 4 Defense Secretaries in 6 years. Wonder if that’s a record? I just couldn’t see him working with Obama, Biden, Kerry and Susan Rice. I imagine the search is on for a handicapped, female Hispanic to fill the spot. All the better if the handicap came as a result of a war injury in Desert Storm. And what do you do when a grand jury decision doesn’t go your way – burn down a neighborhood pizza place and other small businesses. No surprises. Just before the forecast big freeze I picked the last of the green peppers. These bushes had just about played out and had been producing since last May so it was time. I didn’t cover them so they could be a gauge of just how cold it got and provide a comparison between covered and uncovered plants. They made it unscathed so I know the temps never got much below 40. For our location, the normal first freeze date is Dec 15 so I’m hoping we get another month. I look at Global warming vs polar vortex as good vs evil. I’m guessing that the snowbird invasion this year will be earlier and stronger than usual – good for the local economy, bad for traffic. I imagine those poor folks in Buffalo are sure thankful for global warming. Just imagine how much snow they would have had without it. Fingers crossed for my neighbor George. His heart started acting up again, the diagnosis being a problem with the leads on his pacemaker not interfacing properly with scar tissue on his heart. They’re going to cath him today in case the problem is a blockage but they don’t expect to find anything. Apparently the process of removing and reseating a lead is particularly dangerous for him so he may have to face the choice of either slowing way down or taking on the operation. I can’t visualize him slowing down. He’s way too spontaneous so no matter how hard he tries, I can’t see him going passive. Update – Good news, it was indeed a 90% blockage in a critical artery and they successfully installed a stent. He went in for the procedure at noon and I was talking to him on the phone by 5PM. He sounded just fine and will be home tomorrow or the next day. Amazing. Also in the heart department, I have an annual checkup with a cardiologist, not at my doing, which took place the day George came home. The net of the visit was that my heart is fine, my arteries are fine, my lungs are fine and the doctor proclaimed me in better shape than he was. Another update – (that’s what happens when you start inputting one day and then add things as they happen in real time) It didn’t freeze last night so I dodged a bullet two nights in a row. It got down to 40 again but apparently there was just enough breeze to keep frost from forming. I removed the covers and as best I can tell, nothing was damaged at all. I went ahead and loaded a row with cauliflower plants that were started a month or so back. Slowly but surely all the rows are filling up. I’m pretty sure that by Thanksgiving it will be “full” and stay that way until we get a real freeze and the tomato plants are killed. There’s one empty row left and I have 15 cabbage plants in a flat that’ll move to that row next week. I put in a small patch of Tyfon and another of Tatsoi, part of my experimental green experiment. I have a couple of friends that will take anything green so I’ll get some outside opinions to go along with our own. I planted the seeds directly in the garden so it’ll take a week or so before I know if that worked or if they have to be started indoors. I also bulk planted celery seed indoors. That really grows slowly and will be a replacement for one row of tomatoes when those crash next month. The problem with having kids and grandkids in Chicago is that you get no sympathy at all when you tell them it’s cold here. Our outdoor thermometer must be broken because it says 50 and I’m positive it’s closer to zero than 50. I should have driven to Key West last night to ride out the global/ARCTIC/Polar vortex attack. As it is, we’re right on the cusp of a freeze, a couple of degrees one way or the other. We’ll be breaking 80 year records. It’s a big job to cover the garden especially when it’s windy so I’m dithering whether to bother or not. The big loss will be the tomatoes which are also the most difficult to cover in the wind and if it rains at all, a definite possibility, it can break the plants down. But the wind is actually a plus in terms of hampering frost formation and since it’s coming out of the northwest, right across the lake, that small fetch can pick up enough heat from the lake to keep us from freezing. The water temp now is in the mid-upper 60’s. 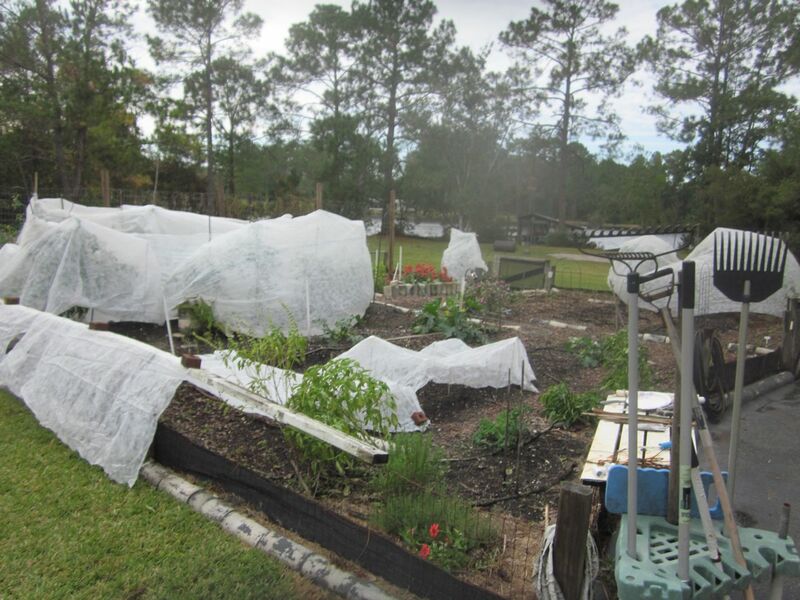 So right now, I’m leaning towards minimal covering to protect tender seedlings and letting the tomatoes tough it out. It should be back in the 70’s in two days so maybe that will be the total extent of our winter. So after all the analysis that said it didn’t make sense to cover the tomatoes, I did anyway. I’ll sleep better and they’ll sleep better knowing I tried. Update – the TV reported temps in our area at 38 at 6AM, so no freeze. I have two thermometers and checked them at 42. The lake warming effect brought us up a few degrees as predicted. By mid Feb lake temps are in the mid 50’s so we still get some protection but not as much. The forecast is for the temps to drop again tonight but not as low as we experienced last night so we should be out of the woods for this winter blast. Glad I’m not in Buffalo. Glad I have Utah clothes even if they are a bit large on me. Glad the Dem’s decided to kill the XL again – the cool aide crowd doesn’t understand how people feel about that. My guess is that after the first of the year several Dem’s will convert – that’s what happened the last time they were routed but in any event, after the first there will be a solid majority to push XL through and let the pres do his thing. Picking radishes, lettuce, and green peppers. I think next week I’ll be able to clip a few Kale leaves to pop into the bullet. What I’m going to do differently this year is to plant a few lettuce seeds into the spot vacated by a picked head. If everything were perfectly synchronized, which it isn’t, by the time I finish the row of the current variety, Summer Crisp, the replacements, variety TBD but probably be a butterleaf, will be coming ready so we have a continuous salad stream. Woke up this morning to the news that Will Muschamp was fired. I knew he was history Saturday when he snatched defeat out of the jaws of victory over South Carolina. With seconds remaining Fla was leading and had the ball. Even though with a minute or so remaining they had missed a simple, chip shot field goal to cement the lead, they still would surely win. Then a blocked punt giving Carolina a few seconds to throw the game into overtime. I was sick and so was the Athletic Director. I’m sure every Florida’s fan first choice is not available – Bob Stoops of Oklahoma. I’d probably make a run at Utah’s coach, I think his name is Willingham or something like that. It worked before with Urban Meyer and he’s certainly brought that team into the big time with some impressive wins over West Coast teams this season. Whoever they choose, please, no Defensive coach from anywhere. I forgot how long it takes Swiss chard seed to germinate. A few weeks back, after soaking overnight, I planted some older seed I had. Nothing happened so a couple weeks later, I planted newer seed in the same patch. Nothing happened so I put in the last of the seed. You guessed it – the original planting started germinating almost a month after being planted and the others have followed along so I might be having special sales on Chard this season. We’ve got some really cold weather heading this way next week so it may thin itself naturally. Somebody asked me if I grew Arugula. I don’t believe I’ve ever tasted Arugula, at least not on purpose. I guess it’s mixed with lettuce for a salad to give it a little “bite” (if you like a bite to your salad). I happened to be in an ACE hardware the other day buying onion sets and I spotted a pack of arugula seeds and decided to put them in an otherwise dead area in the garden. We’ll see. If nothing else I can give them to the person who told me about them in the first place. I also just ordered a few “experimental” veggies – items that sound interesting but for which I have zero background. I figure that with the Nutribullet anything green works so I’m going to try an Escarole/Endive mix, something called Tatsoi and another called Tyfon, aka Holland greens. I was tempted by one called Gigante Di Inverno but decided to hold off on that until next season. I only have the one Nutribullet. These probably would work lightly sauteed in olive oil and served over pasta. That seems to work for anything, especially if you use plenty of red pepper flakes and parmesan cheese. You can also toss in a can of chopped clams or an anchovy and people seem to like it – if you don’t mention the anchovy. Ditto capers. Update – Arugula germinates overnight. Wow, is that fast-especially since I planted it directly into the garden with no soaking or special seed starting soil. It’s the 17th of November and I have to worry about freezing temps tonight. That’s crazy. We should have at least a month before experiencing anything like forecast. I’m hoping the lake is warm enough to give me a boost of a few degrees over the surrounding terrain. The tomatoes are the most likely to get hammered but no doubt the tiny seedlings I’ve been nursing are at risk as well. Normally that would not be an issue because I have plenty of lightweight covers but this is a storm event with strong winds and heavy rain as well as low temps so covering is problematic. I doubt Nancy would give any consideration at all to throwing her body over the most delicate plants. Now I know what all the fuss is about global warming – it gives politicians a great thing to agree on. This morning I saw that Obama and the Chinese leader signed a big agreement to do something about global warming. Why not? They’re working together on something, right. I didn’t see Putin jump on board. Perhaps he thinks Russia could use a little warming. The logic for Obama and the Chinese king is easy – they see the polar vortex thing coming and will be able to claim victory over warming before long – that would be before the 2016 elections. They’ll be walking a thin line though since most people would rather be warm than cold. I also think the colder it gets, the tougher it is to hold the party line that it’s warming. Gardening up a storm. Put in another row of peas, more beets, parsnips and about 100 onions. I even planted a couple rows of leek seed although I expect nothing at all from them. I somehow had the seed so why not plant them. The weather has been perfect and things are starting to accelerate in terms of growth. This vortex thing ran out of gas before it got this far south so we’re still in the 70’s with lows in the 50’s. Having said that, it appears that some really frigid air is heading our way a few days from now. It could dip into the upper 30’s which is approaching the danger zone for the tomatoes and green peppers. Our internet situation made a big change this week. I’ve been modestly happy with the T-Mobile prepaid system. Occasionally it’s fast, more often it’s slow and every once in a while it’s dead in the water. But it’s always been cheap. This week they doubled the price and to make matters worse, they wouldn’t give me credit for a prepaid refill card at the same rate at which it was purchased. I bought a card that was supposed to last 60 days and they unilaterally cut it to 30 days. I would have thought they’d have honored the pre-purchased cards and then just discontinue them at retail. I had been looking at another Walmart offering, Straight Talk Wireless which is some kind of a collaboration between Walmart and and Tracphone which has the potential to be fast and cheap. I was ready to pull the trigger but was a bit gun shy based on several poor online reviews. Tom came up with another alternative from ATT, a prepaid plan called GoPhone. It promised very fast performance and fairly low price if you limit usage. By limit usage I mean keep it in the same range as we’ve operated for the past 4-5 years. It’s actually a wifi hotspot which brings it’s own advantages, portability, but a big downside too. Because it’s fast enough to view video clips, the temptation exists to blast through the data limits (1.5GB) in a heart beat. Tom messed around with it for about 20 minutes and used about 20% of the total available for 30 days. I can see the potential for disrupting the finely tuned social balance in this house and see myself turning into the bandwidth Nazi. This month will be a transition month where we have both the new ATT time and the T-Mobile time available so if we run over on the ATT, we can adjust next month. The other nice feature of the new system is that we elected for automatic monthly renewals. The T-Mobile system wouldn’t allow that and required manual intervention each time you needed to add time or data. Don’t know which made me feel better, the Gators trouncing the Bulldogs or the Republicans trashing the Democrats. The former was a total surprise, the latter not so much. Wonder how long it will take for XL pipeline legislation to hit Obama’s desk? All in all, sure glad the election is over and all those lousy commercials will be put to bed for a year or so. The world is a better place now. Don’t think I mentioned it but while we were at the beach Simon was on a hike in the Smokies – either on or heading for the Appalachian Trail (AT). You might recall there was a freak, early season storm last week which brought snow as far south as Simon. I guess he was not prepared for that kind of weather and at one point found himself waist deep in snow. Some of his gear was not quite ready either and he had a sleeping bag malfunction. He was by himself to start with but met up with some fellow strandees and they managed to make their way back to civilization all safe and sound if not wet and bedraggled. We had company for a few days this past week which is why this posting was delayed. Old friends from the early 70’s in Altamonte who are now living in St. Petersburg came over for a few days. Lot’s of fun. We took a day and went over to Joey’s to show them his house and the construction status of the new boat. I hadn’t seen the boat in quite a while – at least 6 months – and I was truly taken back by the progress. The hulls and the superstructure are now all together so you can see the thing in all it’s glory. It’s starting to look exactly like the plans – a dual hull, James Bond, futuristic look. The battery was dead in my camera or I’d be posting a picture of it here. Maybe next time. It’s still hard to get the scope of it with a single shot because it’s under shelter. Let’s see – in the garden I’ve been planting new stuff all week. Added more carrots, chard, cauliflower, another lettuce variety, more spinach, kohlrabi and kale. Also a load of onion sets – probably 100+ but I didn’t count. The tomato plants are loading up with green tomatoes and blossoms but not sure if the weather will let them live up to their potential – what with the polar vortex and all. Winter is happening – are you kidding polar vortex again after another zero hurricane season. lovin’ global warming. Some wacky scientist on CBS was saying that by 2100 it would be too warm to grow sufficient crops to feed the world. I seem to remember that from the 60‘s when that same problem was attributed to a new ice age and the world’s population growth. Wonder if he’s looked at a map lately to see how much new farmland would be created? Would it be so awful to grow citrus in North Dakota? Forgot to mention how well the wireless home phone worked on the trip. So we have a portable home phone and caught a couple of important calls we would have missed. If I put a small inverter in the car, I could power the whole home phone thing in the car – not that I would but interesting that we could.